You're Here: Home / Blog / Digital Signage / Will digital signage be at EURO 2016? I started by thinking that although EURO 2016 is about football make no mistake it is also about money and sponsors, so what sort of technology may we see at the stadiums. I know that football stadiums have for a long time always had large LED screens and perimeter LED advertising, but what about the more traditional internal screens, such as this installation at Ipswich Football Club? Well, large sponsors such as Nike who have always had the smarts and the budget to do some jaw dropping digital experiential marketing campaigns to promote their brand. One such initiative was the Nike glass around 4 years ago. Modern stadium designs seek to maximise the benefits of technology, with new innovations becoming available all the time. If cleverly used, multimedia and interactive technologies can be harnessed to enhance the spectators’ experience and enjoyment of the match. Smaller stadiums are likely to be more restricted in their budgets but should still be in a position to take advantage of some, if not all, technological advances. Stadium designs should always make provision for cabling channels and signal repetition that will allow any new technology to be incorporated in the future. Advance provision costs much less than subsequent adaptation. Devices such as mobile telephones, PDAs and GPS systems play an increasingly prominent role in our daily lives. Stadium developers can exploit these technologies to enhance their own operations, media services and, perhaps most importantly, interaction with the spectators. There are more and more specialist companies that provide bespoke technology-based solutions specially designed for use in stadiums. Multimedia installations such as video walls, TV screens and automated information systems will continue to become more and more sophisticated and versatile. 3D TV, for example, is already a reality. Higher quality video screens, information panels and internal stadium information networks will all help to enhance the spectator experience in the future. 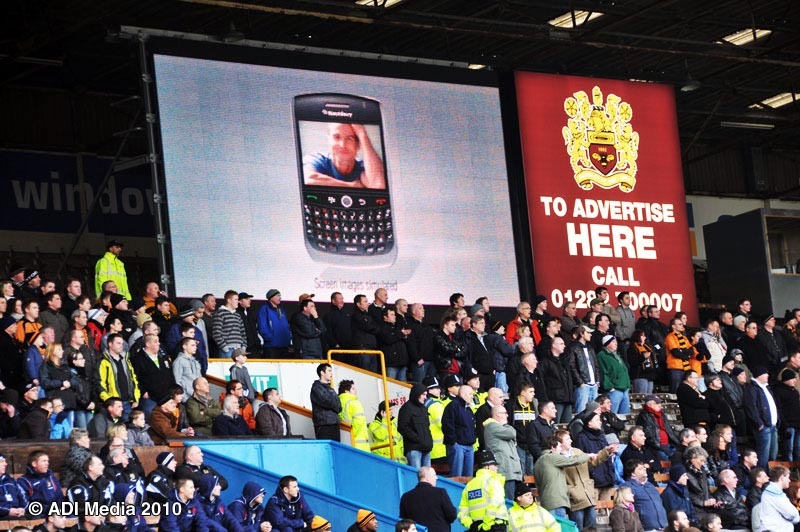 Wi-Fi-enabled stadiums provide enhanced connections for mobile phones and other internet-linked devices, permitting spectators to access a wide range of information and statistics relating to the event they are attending, which can enhance their overall experience. Complex systems can be developed to interact with personal handheld appliances such as telephones and games consoles that can provide fans with multimedia content relevant to the event and, indeed, to other events taking place elsewhere. The scope for expanding online commerce within the context of football events is huge. Many fans already purchase their match tickets online. However, there will come a time when spectators will even be able to order refreshments and have them delivered without even leaving their seats, thus avoiding the often rushed and stressful process of trying to purchase food and drink during the half-time interval. In conclusion, technology is set to play an increasingly prominent part in stadium design and construction in the future. While smaller stadiums may not have the financial resources to take full advantage of every advance and innovation, experience shows that new technology which is initially expensive eventually comes down in cost, making it affordable to more and more stadium developers. So there you have it, even the heady world of football is acknowledging that screens and informational panels (digital signage) is an important way to educate, entertain, and inform their customers. For anyone interested in the whole rather large guide it is available for download here. This entry was posted in Digital Signage, Entertainment, Hospitality, Marketing and Advertising and tagged #avtweeps, #digitalsignage, #proav, EURO 2016, Football, Stadiums by hsmith. Bookmark the permalink.